Listening to Jimmy Buffett can make even waiting in line at the DMV feel restive, so it makes sense that Margaritaville has become synonymous with vacation (there's even a Margaritaville retirement home). There's a mysterious power to that music -- in spite or maybe because of all the kitsch -- and this magic will likely never be stronger than at this new Margaritaville resort. 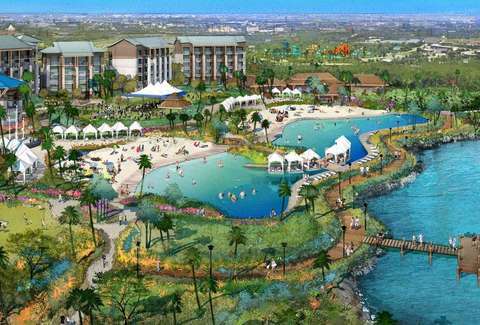 It's appropriately called Margaritaville Resort Orlando and will cover 300 acres, 14 of which will be waterpark. Coastal Living reports that the cheeseburgerly paradise, which opens January 2019, will feature four sections: the Margaritaville Hotel (rates start at $199 a night); Margaritaville Cottages (rentable and ownable); the Sunset Walk shopping, dining and entertainment district; and finally the Island H20 Live! water park. People reports that the park is being billed as Florida’s “most immersive water park" and features a lazy river, a wave pool, nine rides, and rafting. And cabanas and hammocks, obviously. Unfortunately, though, that section won't be open until the spring of 2019. The resort will also be kid-friendly, with kids and teen clubs. But don't worry about that. Kids love Jimmy Buffett. Everyone loves Jimmy Buffet. Right?